This is our first guest post! The following post was written by R. Sanders. Our blog inspired her to go gliding for the first time as she faced the possible dissolution of her 25-year marriage. This blog is all about trying new things, facing fears, shaking it up. I don’t think it gets any braver than this. She welcomes all comments. “Soaring on Long Island” was the title of pamphlet. I had been emotionally “soring” on Long Island, in Westchester and Manhattan for months. Sore and reeling, as my life spun out of control, when my husband moved out. Then it went dark. Literally. My 16 year-old son and I were trapped in a dark house surrounded by downed power lines and massive snow drifts. He lit candles, gave me a tea & vodka (“Did he learn that in Home Economics?” I thought). As I lay wailing in a heap on the floor of a cold, dark house, he put his hands on my shoulders and looked me in the eyes. He made me repeat these words: “I am strong, I can get through this”. I will always regret that he was with me at that dark moment. It became a year of firsts: shoveling snow, surviving power outages that lasted for weeks. The spring brought an infestation of ants, school functions attended separately as Mom and Dad, and even a holiday without my children since we tried to be equitable about where they spent their time. I developed an uneasy relationship with a power drill as I hung a Horst photograph I admired but hadn’t dared previously to hang up, next to my new gunmetal chaise lounge (“is it pleather?” the ex asked). The summer brought the annual beach vacation without the rituals of going to the farm stand and beach together. The warmth of summer was replaced by rain, and then more rain. “I am strong, I am courageous, I can get through this” was my mantra. With each new challenge I became stronger. The old therapy adage: one step forward, two steps backward was the rhythm of my new life. The unwavering support of my friends and family smoothed out the edges and indignations along the way. In the midst of adjusting to my “new normal”, I saw the pamphlet hanging on a bulletin board in the tiny bakery in town. “Sky Sailors- Soring on LI-Glider Rides (it truly was misspelled). 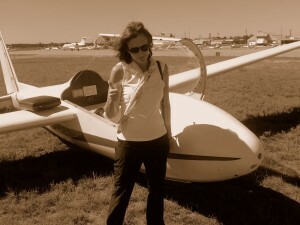 Our experienced pilot will take you high above the earth in our sleek silent glider” www.skysailors.com. On the first August day when the sun finally emerged, before I could reconsider, the tow-plane was taxiing down the runway past the solid airworthy Gulf Streams and Citations, dragging the glider behind it. Panicked, random thoughts ran through my head as I wondered if my boys will survive without me for a few hours or at the very least remember to check themselves for ticks when they get off the beach. Then I remembered to breath deep and chant my mantra “I am strong, I am courageous, I can get through this”. My stomach lurched as we ascended over the Pine Barrens, the quarry pit now used to train police officer for high speed chases, the Tanger Mall and a shooting range. 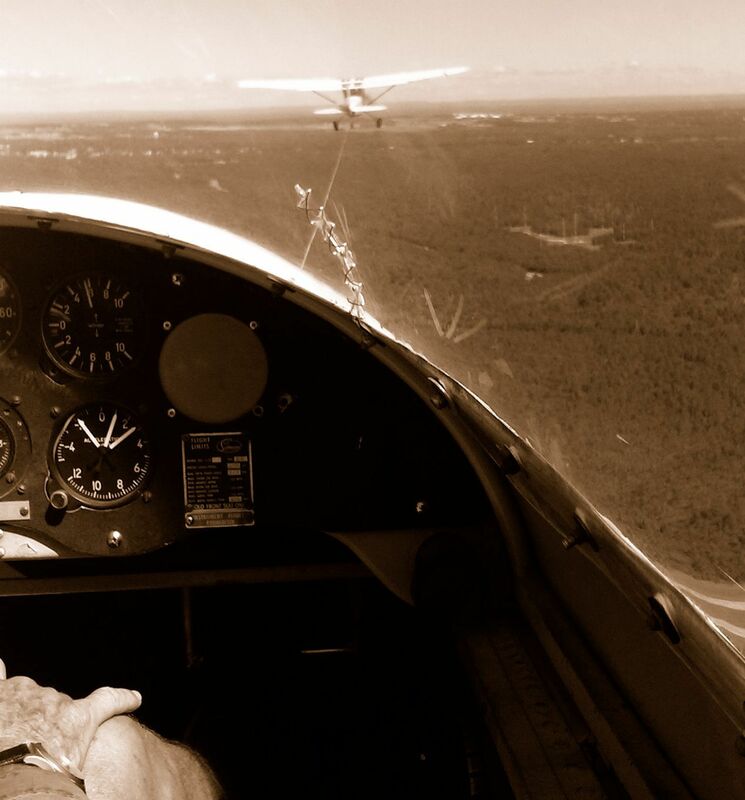 At about 5000 feet up, the pilot shouted something; I felt a terrifying start and a jolt. The tow plane had released the glider. For the first time in months, I found myself in complete silence and my anxiety and sadness began to dissipate. Gliding over the East End of Long Island, I looked down at the twin forks and the small smidgens of land between them (Shelter Island, and that mysterious “research” facility, Plum Island) stretched out before me. Connecticut and The Berkshires beckoned to the North. We turned toward the West and soared silently over Dune Road with the Atlantic Ocean just beyond. A hazy Manhattan skyline poked through horizon. As promised in the pamphlet, the ride was “smooth, quiet, peaceful, and spectacular”. “Time to head back to the airport,” screamed the pilot and I was jolted out of the peaceful moment and we sharply banked, seemingly 180 degrees and then took a nose dive of 500 feet (it was probably only 25 degrees & 50 feet, but I couldn’t tell in my panic mode). “I can do this,” my mind screamed. Several bumps later, we were back on terra firma. Big sigh of relief. According to the Soaring Society of America a glider stays aloft without an engine due to the pull of gravity and sources of ‘lift’. The glider stays in flight if the air mass in which it is flying is rising at a faster rate than the sailplane is gliding downward. The earth, when heated by the sun, warms the air next to it, causing it to expand and rise just like steam coming from a boiling kettle. Rising warm air form into columns called thermals. Barring unanticipated changes, the glider smoothly navigates these predictable natural forces. 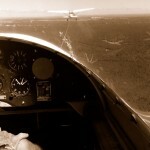 However, an unexpected change of direction may disrupt the tranquil experience of gliding. “The pilot must accept and adapt to these changes”, according to the Soaring Society’s website. I remind myself of this as I try to navigate through new territory. We all should as we face unexpected currents and bumps in life. You are, and always have been, in fact, courageous. I have seen you navigate through other challenging and difficult times over the past 30+ years and you have prevailed. As Nietzsche once said, “what doesn’t kill us, makes us stronger”. It sounds trite, but its true. Your determination and fortitude will enable you to traverse and conquer this rough course. You are an inspiration. R., what an amazing story! You appear to hang tough despite all the turbulence (couldn’t help the double entendre) You will be an inspiration to many!! Just found this blog and hope to read more – and maybe start challenging myself into new things too! Thanks for the comment Jacqueline! I love your work!